Minnesota allows you to complete your divorce without an attorney if you and your spouse can come to an agreement on what to do with your property and how you will care for any children that you have. At least one spouse must have resided in Minnesota for at least 180 days immediately before the divorce is filed. Minnesota is a no-fault divorce state. In a Minnesota divorce, the spouses agree that there has been an "irretrievable breakdown of the marriage." You review and sign the documents in the presence of a notary, then file the Joint Petition for Dissolution of Marriage with the Court Administrator. The Court Administrator will send you a Notice of Filing indicating your case number. You will be notified by mail when the Judge signs your Judgment and Decree of Dissolution, finalizing your divorce. Forms are specific to the state of Minnesota and DivorceWriter offers a money back guarantee if your documents are not accepted by the Court. 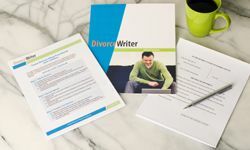 You have qualified to use DivorceWriter to complete your Minnesota divorce papers online. Select "Continue" to start the interview.